KPBS’ Post-Comic-Con Wrap Up Features “Word Balloons” Exhibition and “Comics Are Everywhere!” : COMICS ARE EVERYWHERE! 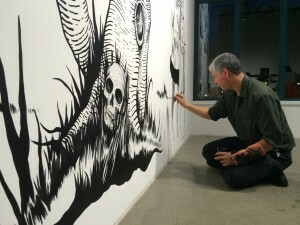 Photograph by Neil Kendricks/ Artist and SDSU alum Hugo Crosthwaite paints the finishing touches at the opening reception for "Word Balloons: Comics at San Diego State University" on display at the SDSU Downtown Gallery (located at 725 West Broadway, San Diego, CA 92101) through July 27. The gallery is hosting a free live-drawing event complete with an artist's model in costume on Thursday, July 16 from 6 pm to 9 pm. Comic-Con 2015 was a slam-dunk success for artists and attendees alike. Now that the booths are gone and the panel discussions and book signings with your favorite artists and writers are a pleasant memory, you might still be craving more comic-book mayhem. You don’t have to look any further than the free live-drawing event hosted by the SDSU Downtown Gallery’s exhibition, “Word Balloons: Comics at San Diego State University” on Thursday, July 16 from 6 pm to 9 pm. The event is scheduled to coincide in with the Museum of Contemporary Art San Diego’s Thursday Night Thing (TNT) event, just one block away. On display through July 27, “Word Balloons” celebrates the student artworks created for the comic-book anthology of the same name that is edited by my artist friend Neil Shigley and myself. The exhibition also features murals created by SDSU alumni Hugo Crosthwaite and Richard Tackett especially for this fun and creative, comic-book-themed exhibition located at 725 West Broadway, San Diego, CA 92101. On Monday, July 13, KPBS invited yours truly to participate in the station’s post-Comic-Con coverage with back-to-back radio and TV segments. You might be asking yourself what can one expect at this Thursday’s free live-drawing soiree? Artist’s model Christa Maier will be in costume, striking a dramatic series of timed poses for artists to draw. Local artists and aspiring creators are invited to bring sketchbooks, pencils, and pens to jump start their own creativity with Maier as inspiration. So, even if your wallet was drained at Comic-Con, you can still get into the groove and push your muse into action for free at the July 16 event. No excuses! Come and make some art! This live-drawing event, however, is a strictly BYOAS event. That stands for Bring Your Own Art Supplies! Since this free event has limited seating, early arrival is encouraged. A word to rthe wise (art) guy and gal out there! Let the live-drawing games begin!